Romany spent some time near the Yorkshire coast at Sleights near Whitby. He bought a cottage near here, still called ‘Romany Cottage’ and wrote much of ‘Out with Romany by the Sea’ in an outhouse. 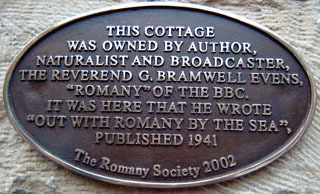 In 2002 the Society invited George Swalwell (‘Tim’ in the books) to unveil a bronze plaque on the cottage commemorating Romany’s time there. Romany also had a beach hut at Sandsend, now long gone, and preached and lectured in the area – including Brunswick Chapel in Whitby.